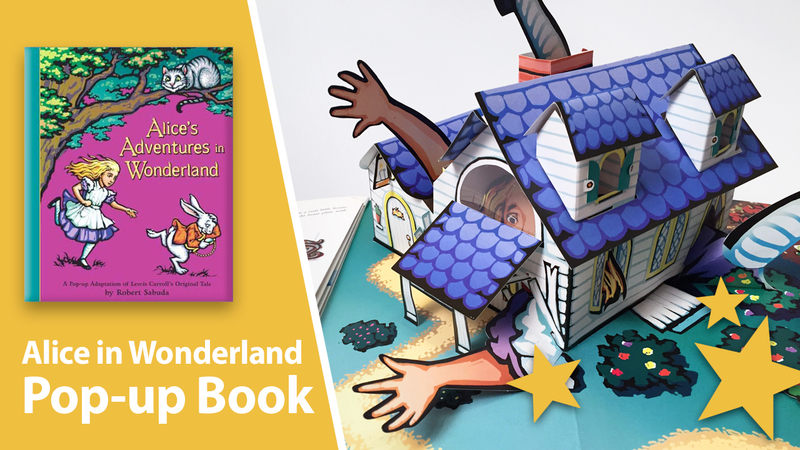 After many requests from our followers and YouTube subscribers, we decided it was time to do a review about the wonderful Alice in Wonderland pop-up book. 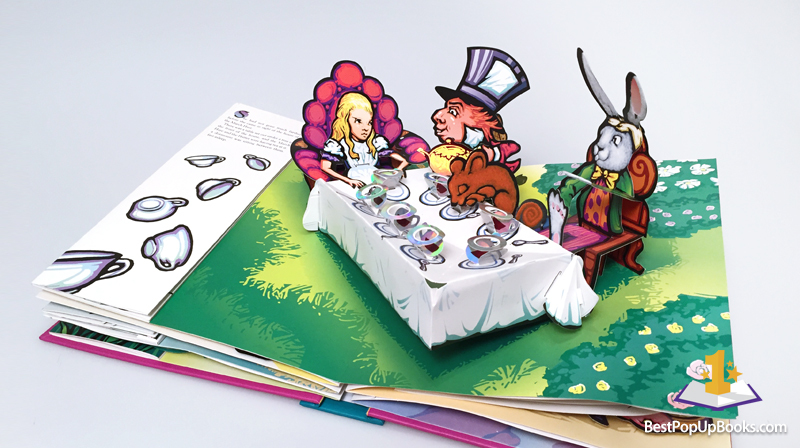 The Alice’s Adventures in Wonderland Pop-Up Book, created by paper engineer Robert Sabuda, is definitely one of our favorite pop-up books in our collection. 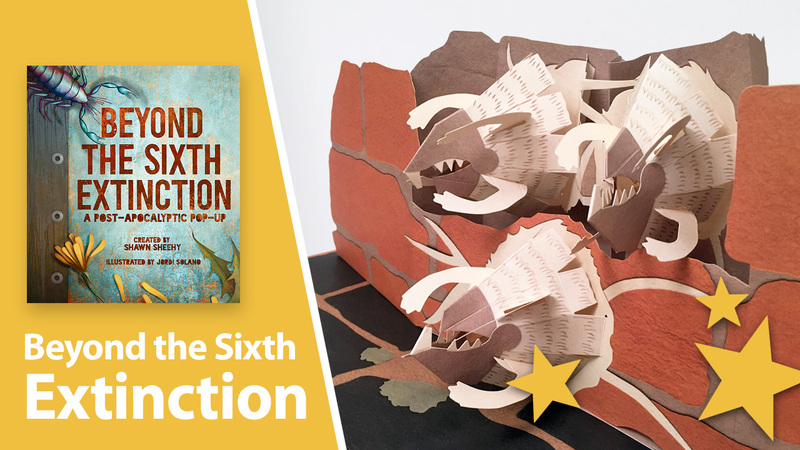 It’s the number 1 pop-up book on our top 10 list! 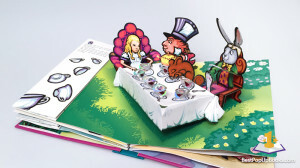 This book tells us the story of Alice, originally written by Lewiss Carroll, through over 6 impressive and very well engineered pop-up spreads. 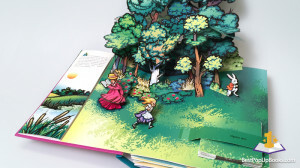 Each spread contains a mini booklet in which the story is told together with multiple mini pop-ups. 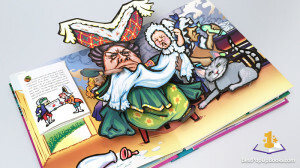 Sabuda’s maintained John Tenniel’s classic style of drawing for this pop-up book, but with the addition of his own personal details, the book gets a nice and fresh look at it. Each pop-up is designed en created with care and attention to detail what makes it highly enjoyable to read. The large pop-up spreads show us some well-known scenes that everyone will instantly recognize from the story. 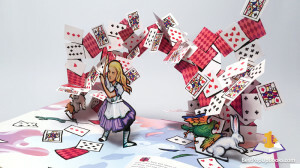 We see Alice grow and shrink, we see her falling down the rabbit hole, she meets the White Rabbit and the Cheshire Cat, plays croquet with the queen, and we experience her nightmare in which all playing cards turn against her. 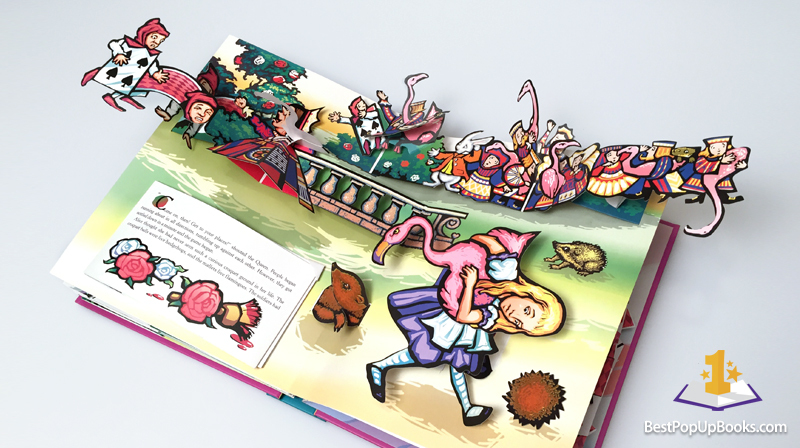 Thereby the book is filled with surprising mini pop-ups that make the story even more complete. The engineering of this book fits so well with the story, we gave it a 9 for storytelling. For example, it’s amazing how the “victorian peepshow” technique creates a real Rabbit Hole. 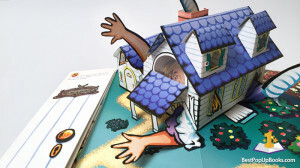 The next spread shows a complete house with details like a chimney and dormers. This is by far one of the most beautiful 3D pop-up houses we’ve seen so far. 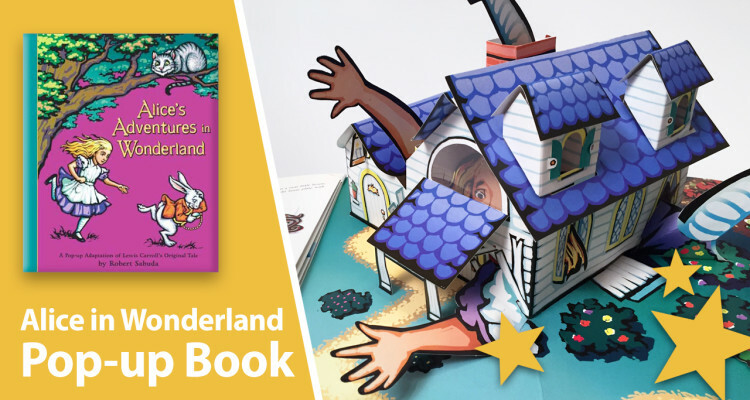 Not to mention that this house also contains a giant Alice, with her arms and legs growing out of the windows and doors. If you look closer, you’ll see her face through the front window, another great detail. 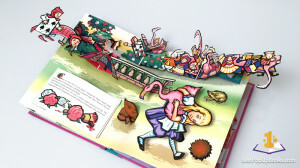 Every pop-up fits the story perfectly and shows how much paper engineering can contribute to an already great story. 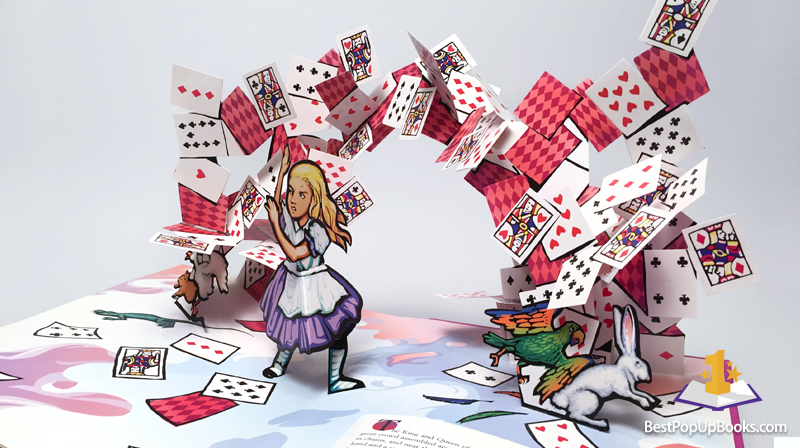 The grand final is the last spread where you’ll find Alice surrounded by a fountain of playing cards. It’s not only the amazing technique, used to make this spread work, that blows your mind. It’s also the way it pops in-and-out. 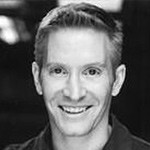 This is guaranteed the only impressive “card trick” in the world that everybody can perform. It’s a unique 360 experience. 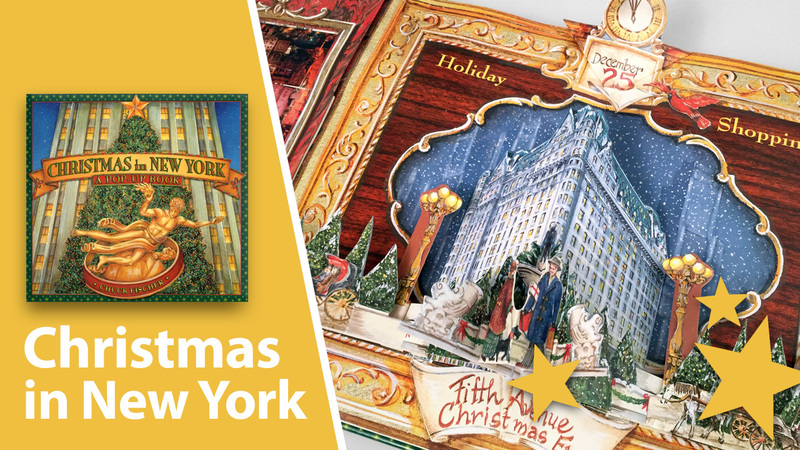 Like every spread in this book, you can view this creation from all angles, making it a perfect spread to display in your collection. All pop-ups in this book are solidly engineered and pop in-and-out with ease. Some rotate, some use transparent sheets, some just snap in place and all spread pop-ups are spectacular to see unfold. 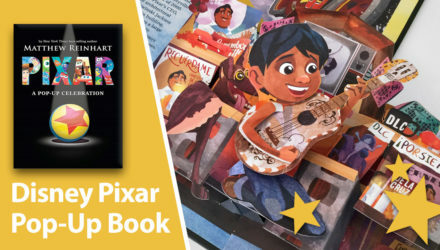 This breathtaking pop-up book is exciting and entertaining for all ages and an absolute must-have for everyone who loves pop-up books. We definitely recommend it!